Preheat oven to 425°F. Heat a large nonstick skillet over medium heat. Coat pan with cooking spray. Add green onions to pan, and cook 2 minutes or until tender, stirring occasionally. Remove from heat. Place mashed potatoes in a medium bowl. Stir in onions, cheese, salt, pepper, and bacon. 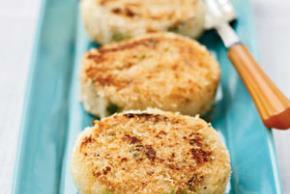 Divide potato mixture into 6 equal portions, shaping each into a 1/2-inch-thick patty. Place panko in a shallow dish. Dredge patties in panko. Place patties on a baking sheet coated with cooking spray. Bake for 12 minutes. Carefully turn patties over; bake an additional 12 minutes or until golden.